MacTicker brings the stock market to your desktop | Thbthttt! MacTicker updates this information once a minute right on your desktop. You can configure it to alert you to stocks that are doing particularly well, or warn you when a company is sinking. 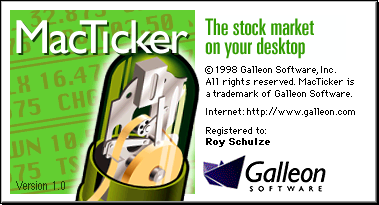 But instead of just displaying a static page for each stock, MacTicker builds a scrolling display containing the status of each of the stocks you’ve chosen. It also displays detailed information on individual stocks that is updated along with the information on the ticker, from a comprehensive report of the stock’s fundamentals to a tiny display that you can move into the corner of your desktop and watch in the background. MacTicker gathers American, Canadian, and European market information from any of a number of online financial sites. Each of these sites offer free delayed stock quotes from a number of different sources. Delayed quotes are generally 15-20 minutes behind the expensive real-time service required by professional traders, but are well suited for the casual investor. An unregistered copy of MacTicker runs for thirty minutes before it quits, but otherwise lets you evaluate all of MacTicker’s features before you decide to purchase a serial number.